The world is stunned beyond belief and the Christian world is spinning in total disarray and confusion. A worldwide announcement has just been made from reputable sources that Jesus' grave and His bones had been discovered and positively identified. 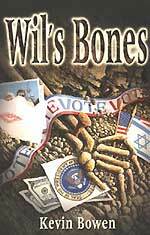 This book has been compared to John Grisham and Tom Clancy. 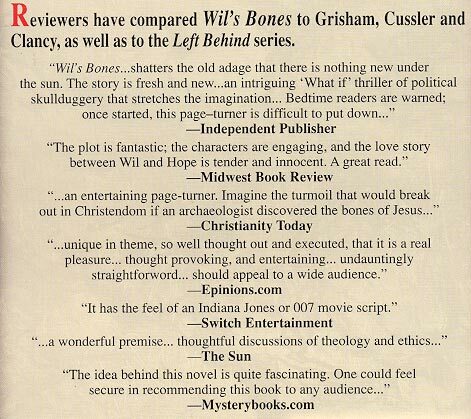 Wil has hated Christianity all his life, and now he is in a position with a relationship with the Israeli Secret Police to stage the one event he knows will drive a stake into the heart of every genuine Christian living: Jesus did not rise again from the grave! His bones have been discovered and positively identified. Fast-paced action that will keep your attention riveted to the very end. Plan to read it when you can afford to stay up all night. NOTE: UNTIL THE LAST CHAPTER, IT APPEARS THE BOOK IS TEACHING THAT JESUS' BONES HAVE BEEN DISCOVERED. THE LAST CHAPTER REVEALS THAT WIL DISCOVERS INFORMATION WHICH CHANGES EVERYTHING! VERY EXCITING ENDING - LIKE A TOM CLANCY NOVEL! !